Since I started blogging, I had known so many Indian food lovers and bloggers alike out there. If you want to be swarm by it, go over and get the links from VK of My Dhaba. Meena from Hooked on Heat had suggested a monthly cookout celebrating Indian cuisines in various forms, called as From My Rasoi, literary meaning, from my kitchen. Every month Meena would come up with a theme and for this month, along with the cold period in half part of the world, the theme is “Winter”. Winter is a tough theme for a tropical gal like me. In Malaysia, it is either rain or shine here. When it is hot here, it can be burning hot. You would not want to be caught out in the sun especially right at noon. In fact, you can have burning sensation on your head. During my high school days, I was a school basketball players and fanatically, we play till 11am when the sun is high and our head is about to set on fire. Although it is really hot around, we are still lucky as the air is humid and never too dry plus we get a fair share of rain all the time. In Taiping, as I had mentioned as the wettest town in Southeast Asia, I had countless times of enjoying the cooling rain while I sleep. Sometimes I do wish for four seasons like other countries, where we can enjoy the sun in the summer, catch fallen leaves in autumn, throw snowballs at winter and enjoy rebirth of nature in spring. But sometimes, I revel in the fact that we have consistent weather and nothing to worry about, just maybe occasional floods. So therefore, my interpretation of the theme may vary a lot from people but I feel, as for winter, it is a cold time calling for hot food! Coincidently, all Indian food is hot! And I meant not just the high heat but spicy and exciting. As for me, this month I will be featuring a really delectable dish that was introduced to me in a recent food gathering. As I had mentioned a few times, I am actively involved in a Singapore/Malaysia food forum Kitchen Capers, where we had organized a meet up, joint with another local forum that I was recently introduced to – Jo’s Deli, last month for both Malaysian members. 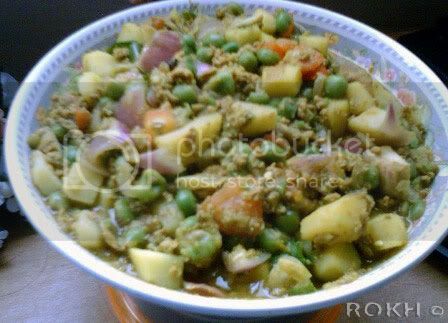 There, a member had cooked up a delicious and ‘never get enough of’ dish – Lamb Kheema. Oh it got me dreaming of it day and night after the gathering. So, naturally, when everyone posted up their recipes, I try this one out first straightaway. Meena had also cooked up some Keema Matar, with ground chicken and peas. I totally agree with her on the part about peas, as I personally feel it is the main ingredient that made the dish at the right texture with the right taste. Not to mention it adds more colour to the dish and of course, more nutrition. Now, without further ado, let me introduce you this hot dish for cold times or to level your winter, if you are in one. I had used ground pork for this dish but found that the lamb that I had in the gathering had much more complex taste, but nonetheless this was also really tasty. This is a simple yet wonderful dish, certainly a keeper in my rasoi! In a bowl, mix the meat with ginger-garlic paste, curry powder, salt and ½ cup water. Then heat oil in pan and fry the ingredients for frying. When onions are soft, add the mince meat and fry till fragrant. Add the potatoes and stir in 1 ½ cup of water. Bring to boil. Cover and cook till potatoes are soft, stir occasionally. Then add cubed tomatoes and onions, peas, chilli. Cover and cook for another 3-5 minutes.